My sweet tooth is back. And I have leftover zucchini. 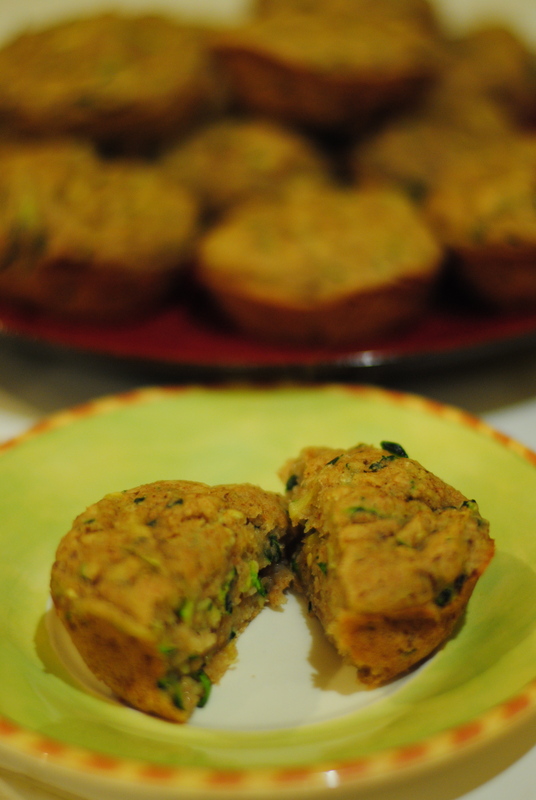 What better late summer/early fall treat than zucchini bread muffins? (I found a few “Jewish recipes” for zucchini bread, including this one, which says that the recipe yields two loaves and you should give one to a friend (is that why it’s Jewish? Like compassionate baking? Zucchini tzedakah? Is that a thing?) Here’s another one, which proposes that this is a good way to get your children to eat their vegetables. Is THAT Jewish? I mean, OKAY, whatever, let’s presume it is — sure, let’s give our kids tons of sugar with shredded pieces of zucchini. That’ll work. Brilliant. Right. I enjoy one of the first comments that raises this: “I could be wrong but it looks like there is a lot of sugar and oil in this recipe! Maybe reduce the sugar and replace some of the oil with applesauce? And does it need salt? Maybe cinnamon and vanilla for flavor?” Yeah, thank you, someone with a little more common sense. The Atlantic’s “Hiding Vegetables in Other Food Isn’t Going to Make Kids Healthy” addresses this pretty well. Sure, why not give them delicious baked goods with veggies, I guess, if they’re aware of the joy that is zucchini known separately from the cups of refined sugar — which seems unlikely when we’re putting veggies in baked goods just to make sure they’re getting eaten (sort of). Lemme go back for a minute, though.. I’m curious…how’s this Jewish? Just because it’s categorically kosher? I know I said I’d document my Jewish journey, and it seems I’m doing just that. Let’s just be honest right now. I’m frustrated beyond belief. I’m frustrated by the Jewish community, frustrated at my own lack of belief, frustrated by the inability of people, or the passing of time, to make me feel like Judaism brings something to my reality, that enhances me, that provides structure or safety to me. I’m frustrated that my secular identity is still so much stronger. Frustrated that at a fundamental level I do not trust religion — or the men who think they speak for it. Perhaps especially those men. Zucchini bread is delicious, certainly, with some spice, zing, and a ton of moisture, making is pretty easy to veganize and enjoy all the same, but it’s not “healthful.” Period. Sometimes it’s just that simple. I think we love to pretend that we know what we’re consuming and that we’re smart about it, especially in this country, to such an intense degree that I think I walk amongst some pretty delusional people. Lemme forget about it, though, while I consume a bunch of these muffins and zone out with the Internets like the rest of my generation. Mmm, fat. Mmm, mindlessness. We have cravings sometimes, and sometimes we should just enjoy ourselves. But let’s not pretend we’re doing ourselves, or our children, a favor by thinking we’re being healthful in consuming zucchini this way, okay? I dunno what my deal is right now. I couldn’t even keep the oven shut while they were baking. It’s one of those weeks. Muffins muffins muffins muffins. By muffins muffins muffins muffins, I kinda mean Friday Friday Friday Friday. 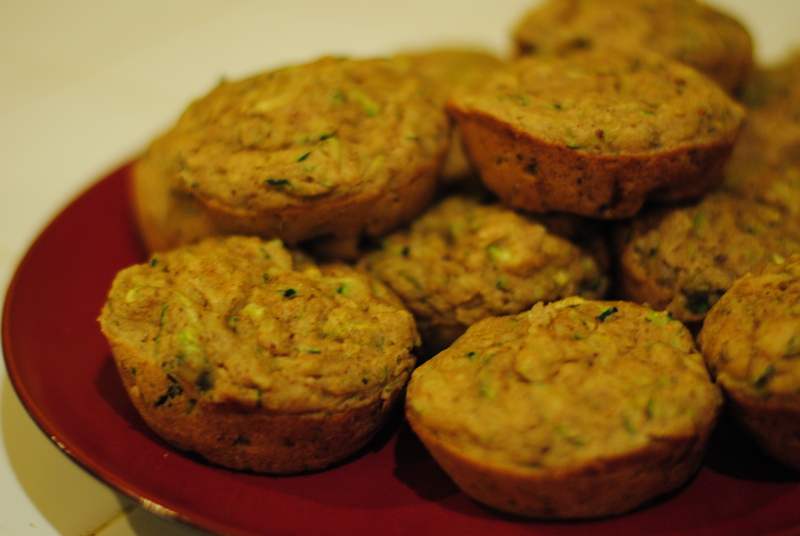 And if you’re curious — zucchini shows up in the Encyclopedia of Jewish Food all of once, as Tunisian zucchini relish. And that’s 656 pages of truth. Thank you, Gil Marks. 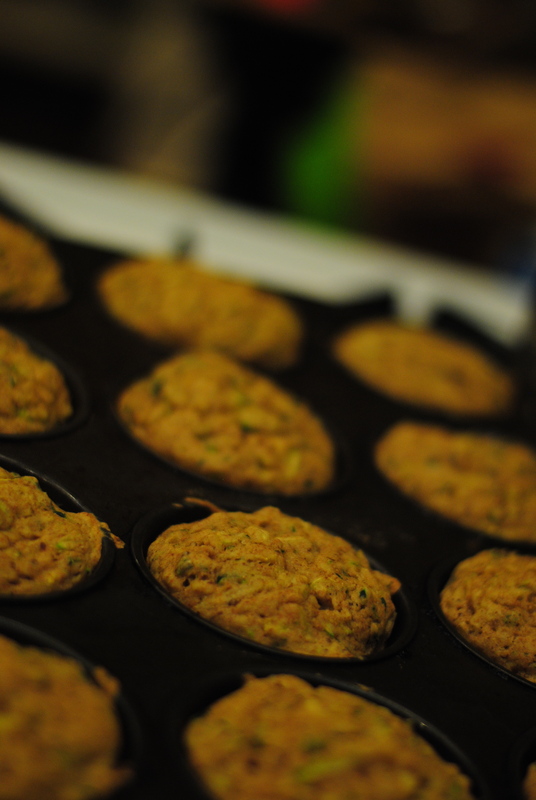 Grease two muffin tins. Preheat oven to 350 degrees. In a large bowl, mix the flax seed eggs in a small bowl. Set aside. Grate zucchini in the meantime. Set aside. Add sugar, vinegar, applesauce, maple syrup, almond milk and vanilla to the large bowl; beat well. Add grated zucchini; stir until combined. 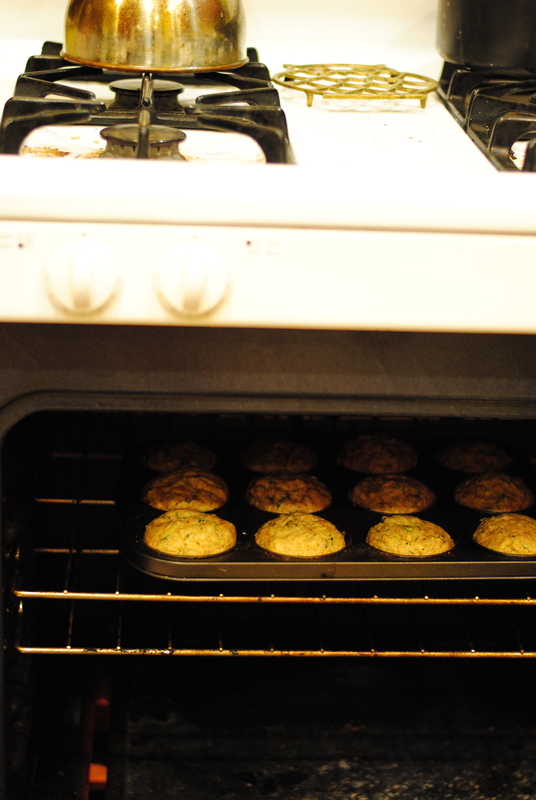 Bake at 350 degrees for 35-45 minutes until golden (a plus side to making muffins is reducing baking time!). Let cool a few minutes before popping those muffins out of their pits.